The Barbour Barnacle Top is a flattering wardrobe essential that has been crafted from a stretch jersey fabric. 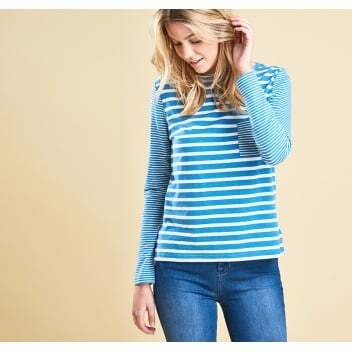 Featuring stripes on the body as well as contrasting stripes on the arms and chest pocket, it is finished with a wide neckline and long sleeves. Team with your favourite pair of jeans and a contrasting print scarf for a smart/casual look.